The Raritan DSXA-48 is a Dual-feed AC power, dual-Ethernet 48-port secure console server with internal modem, 1 console port and a 19" rack mount kit. The Dominion DSXA-48 is a secure console server for local and remote access to serially managed servers and other serial devices via SSH/Telnet and Web browser. 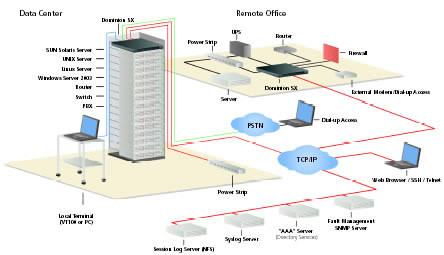 Dominion SX allows access and control of up to 32 devices including: servers, routers, switches, VPNs and power strips. It can scale across hundreds of users and thousands of devices, highly secure, easy to install and simple to use.